Thoracic surgeon Dr. Sunil Singhal at the Abramson Cancer Center has developed glowing tumor technology that should increase the effectiveness of aggressive surgery for malignant pleural mesothelioma. Singhal has shown recently that by adding a contrast agent that makes tumor cells glow, a more complete surgery can be done. This potentially avoids the now almost-inevitable cancer recurrence. Singhal and his colleagues from the Abramson Cancer Center at the University of Pennsylvania in Philadelphia detailed their recent study of the technique in The Annals of Thoracic Surgery. Abramson is currently the only cancer center using the TumorGlow technology, devised by Singhal, to improve the detection of macroscopic residual disease during surgery for mesothelioma. The recent study involved 20 surgical patients at Abramson with pleural mesothelioma between January 2016 and April 2017. All procedures were done by either Singhal or thoracic surgeon Dr. John Kucharczuk. Although the goal of the pleurectomy and decortication (P/D) procedure and the extrapleural pneumonectomy surgery is complete resection, rarely does it happen. This explains the five-year survival rate at just 15 percent. Unseen tumor cells left behind after surgery typically multiply with a vengeance. Unlike many solid cancers, mesothelioma is scattered in nature and spreads thinly throughout the thoracic cavity. In some cases, those early tumor cells also can be difficult to distinguish from healthy tissue, or properly identify. To combat the recurrence problem, doctors have tried combining surgery with other options, including post-resection photodynamic therapy, hyperthermic intraoperative chemotherapy or neoadjuvant hemithoracic radiation. They each produced only modest results. The TumorGlow concept is similar to wearing night vision goggles or watching a crime scene investigator use a specific type of light to uncover bodily fluids that were invisible to the naked eye. With TumorGlow, a patient is systemically infused 24 hours before surgery with a tumor-seeking dye called intravenous indocyanine green (ICG). 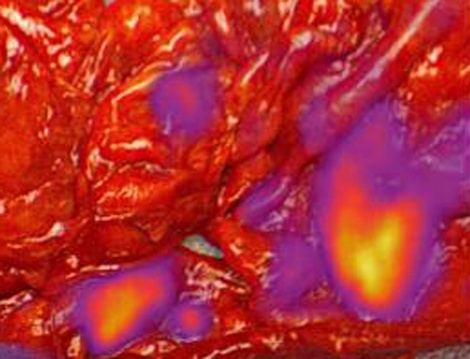 When activated by near-infrared (NIR) imaging during surgery, those tumor cells light up, becoming easier for the surgeon to see. They differentiate themselves from benign inflammation. Resection of a pleural peel that shows a before-and-after look at the TumorGlow technology. As part of the study, the NIR light was not activated until the surgeon was satisfied he removed all visible cancer. Of the 13 patients who underwent P/D, 10 had macroscopic residual disease that was only identified with the NIR imaging and otherwise would have been left behind. And in the 10, there was a median of 5.6 residual deposits per patient that were resected. Many were in difficult to reach locations or where blood or acute inflammation hid them from traditional visual identification. A smaller cohort where TumorGlow was used in the study involved seven patients with earlier-stage thoracoscopic (pleural) biopsies. In six of the seven, glowing tumors were clearly detected and all six were diagnosed with mesothelioma. The seventh had no glowing tumor cells and later was found to have only benign mesothelial inflammation. The study also found the fluorescent signal was in 100 percent of the mesothelioma lesions that were sampled. The systemic injection of the ICG dye was well-tolerated with only one patient experiencing minor toxicity. Singhal said the TumorGlow technology also has worked particularly well for neurosurgeons and brain cancers. The study concludes the TumorGlow technology can serve as an adjuvant — but not a replacement — for current diagnostic testing. It also emphasizes surgery remains the most effective treatment option for improving patient outcomes.